It’s finally here! 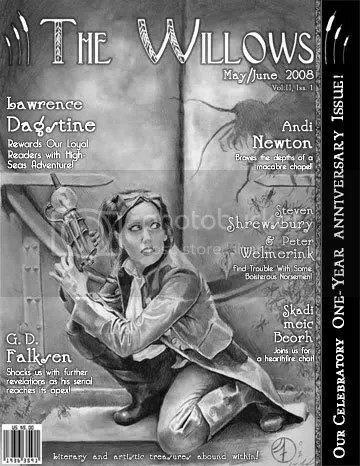 The spectacular One-Year Anniversary issue of one of dark fiction’s most popular magazines: THE WILLOWS! And, once again, I am FEATURE AUTHOR. Only this time I surprise the reader with a title picked out by Frances Rowat, as part of a special subscriber contest. Set sail with me and editor Ben Thomas, and a plethora of other talent with tales of their own, as I take you on a monstrous World War Two voyage reminiscent of Ancient Greek Myth and Lovecraft’s DAGON! Featuring Work by: Lawrence R. Dagstine, Andi Newton, Steven Shrewsbury & Peter Welmerink, Skadi meic Beorh, G.D. Falksen, and many more! 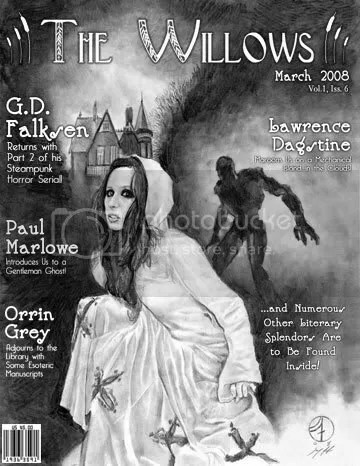 Through the work of rising authors like G. D. Falksen, Lawrence Dagstine, and Paul Marlowe, we are also pioneering the genre of “steampunk horror,” in which elements of the golden age weird tale or Gothic romance are combined with an elegant 19th-Century proto-science-fiction aesthetic, such as that embodied by Wells, Verne, and the earliest pulp writers.